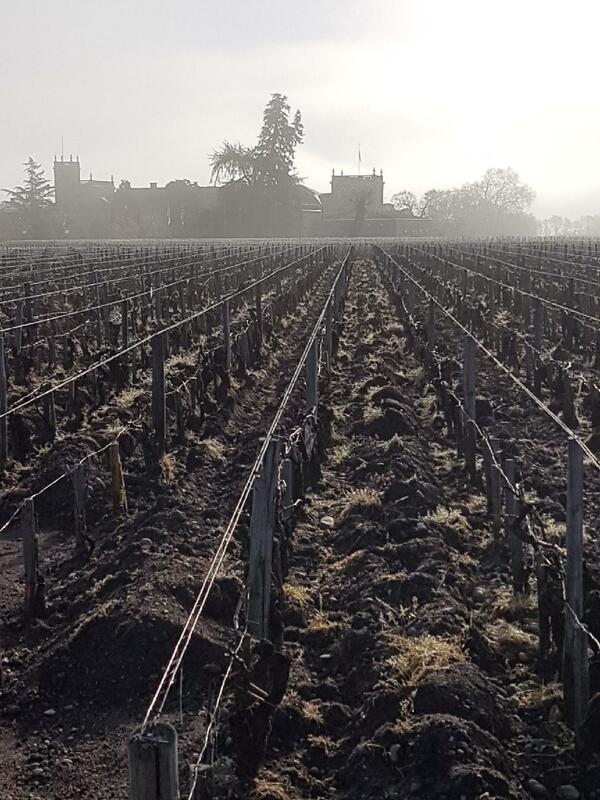 The day rose, quite literally, as fog smothered the Médoc this morning and it was only when the sun started to burn it away that the chateaux and, finally, vineyards, became visible, lifting like a soufflé out of the vapours. My arrival at Ducru was timely and my decision to stop on the driveway on the way in, rather than the way out, was proved to be the right one in the results of the photograph you can see above. So, today I've undertaken a string of rather lofty chateau visits in the Médoc. As mentioned, I started with Ducru Beaucaillou, then hopped up to Léoville Lascases. Having tasted there, I left my car in Lascases's yard and headed along the road to Léoville Poyferre. Having a hiatus of an hour or so, I drove to Pauillac and wandered along the waterfront in bright sunshine, watching a large boat turning heavily into the incoming tide. Pontet-Canet was next for both a tasting and lunch and the lunch here is justifiably famous, not least for its extraordinary spread of French cheeses. One year I really should pass up starter and main course and simply sit for an hour stuffing myself with dairy in an attempt to sample them all. Everything I tried was in the peak of condition and completely delicious. So...what have I found? Nice wines, that's for sure. An elegant Ducru, a rather Latour-like Lascases, an oaky, supple Poyferre, a Pontet-Canet absolutely stuffed with matter and energy; already complex. And so it went on after lunch. The story of the year is, like a football match, one of two halves. Up to the solstice, it poured. And I mean poured. 650mm of precipitation fell in the spring. And then turned itself off. From then on - up to the end of September - there was nothing more. Then, a little squirt before harvest plumped up and freshened the fruit and, voila, a rather pleasant harvest of perfectly ripe fruit picked under blue skies. The Von Trapp family were probably on hard to give a rousing chorus of some-or-other ditty. Now, the important bit: the wines. The '16s I have tasted today have been dense-but-elegant; ripe-but-fresh; powerful-yet-subtle. 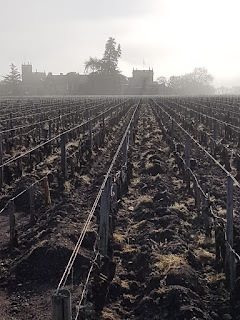 Alcohol levels have varied from 12.9% to pretty much 15% and this reminds me a bit of last year, when the variety of styles on offer made me suspect that some of the decisions in both vineyard and winery were not totally straightforward. These are wines that will, I think, keep for a long time. Half a century in some cases. And they will give pleasure relatively early in some cases, I think. IPT levels - total phenolic content, including tannin - are, in some cases, off the charts. Le Crock, tasted at Poyferre, was at 94. This is almost unheard of. Lascases is at 82: high enough, when one considers that its 2009 and 2010 (themselves among the most tannic vintages of all time) was 74 and 70 respectively. None of this is to say that the wines are hard, unfriendly or tricky to assess. On the contrary, they are really pretty open and easy to investigate. And one does sometimes wonder whether the wines of Bordeaux are changing in style to something new and different. I may have further thoughts about this after tasting more '16s in the days to come.